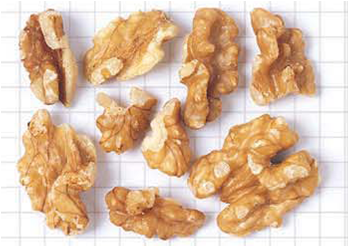 Our Products - Crain Walnut Shelling, Inc.
Crain Walnut Shelling, Inc. specializes in quality shelled walnuts grown in the fertile Northern Sacramento Valley. Our Crain of California "Red Box" Chandler variety and other premium varieties are recognized worldwide. 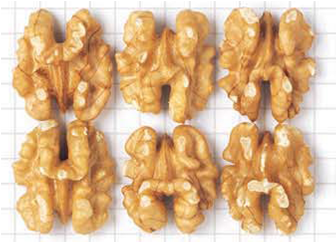 Crain Walnut Shelling, Inc.'s primary business is the processing, packing and shipment of walnuts as a wholesale manufacturer. Although our typical minimum order requirement is 2,000 lbs., we have made available these three products in individual carton quantities for consumers who may not be able to purchase our brand otherwise. Please confirm the quantity for each item before adding it to your cart. If you live within the local area and you would like to pick up the product, please select "Local Area Pick Up" and a representative will contact you once the product is available. Our partnership with PayPal has increased the flexibility of our payment options. For your convenience, we now accept most major credit cards. If you would prefer to pay by check, click the "Pay by Check" option below. All orders are subject to availability and confirmation. Standard shipping applies to the 48 Continental US States only. Our Light Halves and Pieces are made of 20% halves with the balance in large pieces. This product is comparable to the one pound bags found in supermarkets. Same as item above packed in 1lb retail zip lock bags. Our Light Chandler Halves are our premium signature product. They are a specialty item comprised of 80 – 90% halves. Some breakage may occur during transit. Today I received my first order of Crain walnuts! All I can say is "Wow"!!! I bake and cook a lot and have used local vendors for my walnut needs; that ended today! The walnuts delivered were outstanding, size, color and most importantly TASTE! I am most impressed and will sing your praise to others. Thanks for delivering your very best!" Crain Walnut Shelling, Inc. 2019. All Rights Reserved.